One hundred and forty of the 200 pilot whales stranded themselves on Farewell Spit, Golden Bay, South Island, New Zealand, have died. 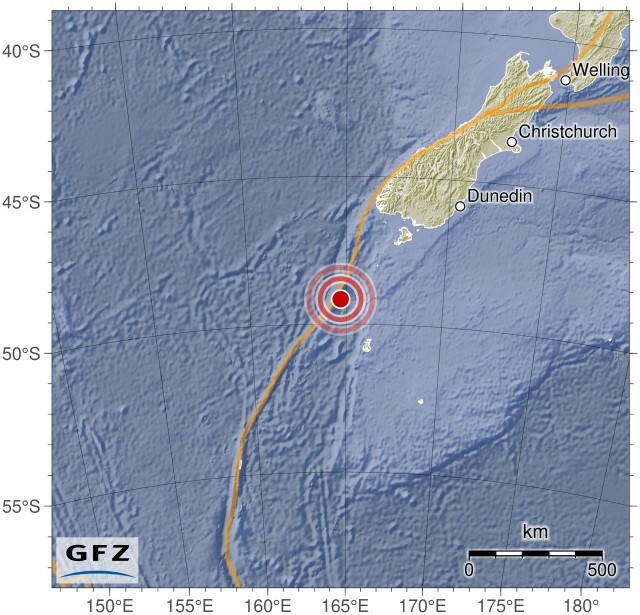 They were injured by an earthquake south of South Island (see below). About 80 conservation workers and volunteers were trying to refloat the whales as high tide rolled in, Department of Conservation area manager Andrew Lamason said that Farewell Spit is a big, shallow hook. The whales come in, they get disoriented, and unfortunately we end up with a lot of dead whales. We've had plenty times in the past where the pods have gone out to sea and turned around and come back again," he added. This disorientation is supposedly cause by the shallow water. The question is if shallow water disoriented them, why didn't they just just stay offshore where they could navigated? Humm? Don't sound right to me. My 40 years of research says pressure changes during the earthquake caused them to be disoriented (see below). I believe what Lamason pointed out is in fact easily observable clues: I SAY THE ENTIRE POD LOST ITS SENSE OF DIRECTION DURING THE EARTHQUAKE AND LONG BEFORE THEY NEARED GOLDEN BAY! Reason along with me. Anything floating or swimming in a current without a sense of direction will always go downstream -- it's simply the path of least drag. With the tide coming in and the strong shoreward wind, the downstream current will flow towards the sandy beach. In fact, the inward flow of the current is what built the beach in the first. This is why they called it whale beachings. It also stands to reason that you can not get the whales to swim away from the sandy shore when the tidal currents are flowing in towards land. This also explains why they all beached at the high-tide line. The current kept pushing them up and up as the tide level increased. 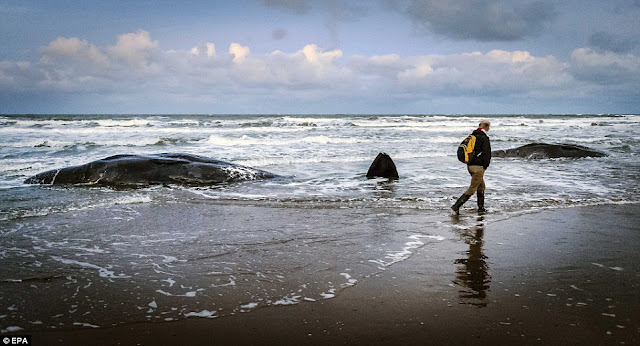 If you force them to swim away from shore before the tide changes directions and starts flowing back out to sea, the current will turn the "LOST WHALES" around and point them back to the beach. That's why, even though the whales are floating free, the rescuers always wait until 30 minutes after the tide has crest and then release them. It's that simple -- if they're gonna save "WHALES WITH DEFECTIVE BIOSONAR SYSTEMS" they must push them off the beached with the outflow of the tide. In other words, the whales don't "come in and then get disoriented." They were disoriented by the seaquake long before arriving near shore. Ask yourself, what other violent natural disaster has the power to injure an entire pod at the same time? The answers are: shallow submarine earthquakes, explosive volcanic eruptions, the violent impact of a heavenly body with the surface of the sea. You can also add Navy sonar, oil industry airguns, an massive underwater explosion. According to Radio New Zealand, the whales that are free still need to swim towards open waters. Conservation Ministry spokesperson Mike Ogle said that he hoped that the tide would help the whales reach the deep seas. In other words, he hopes tidal outflow will wash them far enough offshore so the sharks can feast on the dying whales. The sharks darn sure know the whales are in trouble and will be dogging them until the last whale is dead. This is nature's way -- it is the survival of the fittest. The sharks in this case are far more fit than the seaquake-injured whales. This pod of pilot whales was guided into the beach by the inflow of the tide, which was increased by the shoreward flow of the wind. As you can see in the video, the small white caps on the surfaces shows that the wind was obviously blowing south along the shoreline and giving the flow of surface waters a strong set inland. Actually, surface currents flow to the right of wind direction. You can tell these whales were totally disoriented. What you can't see is that they had likely been totally disoriented long before they neared the shore. SEAQUAKE CAUSED THE ENTIRE POD TO BE DISORIENTED! On the 6th of January, this pod was diving and feeding on squid above the earthquake fault zone that runs along the edge of the Puysegur Trench, south-southwest of South Island. A shallow undersea earthquake suddenly erupted in the seafloor. The seismic waves entered the water as compressions and rarefactions (sudden increases and decreases in ambient water pressure). Fast changing water pressure is the worst nightmare come true for any diving, air-breathing mammal. The rapid fluctuations in the surrounding pressure generated by the earthquake was too excessive for their pressure regulating anatomy and they suffer a barotraumatic injury somewhere within their massive cranial air spaces. Cranial air serves the whales as acoustic mirrors, bouncing and focusing returning echo-navigations clicks in a fashion to make their biosonar work. Thus, barotrauma in these air spaces will knock out their biosonar and prevent them from diving and feeding themselves due to pain. Since they are instantly LOST AT SEA after the accident, no matter which direction they try to swim, they will be turned by the resistance to the flow of the current (drag) and pointed downstream. It can be no other way. (read more about loss of navigation in seaquake injured whales). As mentioned above, with no sense of direction of their own, the seaquake-injured pod is guided in the path of least drag. It can be no other way. If you doubt it, just go swimming with a blindfold over your eyes. The current will turn you downstream in less than 15 seconds. Furthermore, if the surface currents shift from their normal pattern due to storms at sea or a temporary shift in the normal wind patterns, pods will not strand where one expect them to strand. Many times they strand at all -- the sharks get them first. In this particular stranding, the pod was at sea longer than one would expect. The quake is epicentered in the lower left of the chart of the currents below. The flow was not very brisk. It appears that they were carried slowly due north of the epicenter and might have even been carried passed the tip of South Island and then washed back into Golden Bay by counter-currents flowing south along the shore of North Island. There are also many small current eddies west of South Island. That their journey took longer then normal, fits with the slow surface currents and wind conditions prior to the stranding. Quakes greater then 6.5 mag. are not thought to cause mass beachings because microquake activity usually begins days before the main event. Whales would hear the popping noises of the microquakes and scamper away in time to prevent injury. It might also be that during periods of over-aggressive feeding, some pods might ignore the microquake precursors, pushing their luck too far. At what point would a pod of hungry toothed whales get spooked and swim away from the area? The enormous increase in oceanic background noise might also be preventing the whales from hearing the microquakes they rely on to signal danger. Deafwhale Society, the oldest marine mammal conservation group in the world.